August 4 is National Chocolate Chip Day. Chocolate chips are a common baking ingredient in the United States. Chocolate chip cookies are even considered to be a quintessential American dessert. Chocolate chips are small chunks of chocolate which usually have a round, flat-bottomed teardrop shape although square or rectangular chocolate chips also exist. They may vary in size but are usually no more than 1 cm in diameter. Originally, they were made of semi-sweet chocolate, but later other varieties have emerged. Chocolate chips can be made of bittersweet chocolate, dark chocolate, milk chocolate, white chocolate, mint chocolate. Ironically, chocolate chip cookies were invented before chocolate chips. 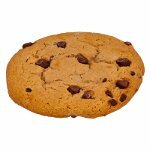 In 1937, Ruth Graves Wakefield of Massachusetts added chunks of a Nestlé chocolate bar to a cookie recipe. Her cookies became a huge success. She contacted Nestlé, and the company agreed to print her recipe on the semisweet chocolate bar's packaging in exchange for a lifetime supply of chocolate. In 1940, Nestlé started to produce and sell chocolate in chip form. Chocolate chips are often added to cookies, cupcakes, muffins, pancakes, crêpes, waffles, pies, cakes, pudding, ice cream, trail mix. They can be used to make hot chocolate. To celebrate National Chocolate Chip Day, treat yourself to any pastry, dessert or beverage that contains chocolate chips.